Zion Market Research has published a new report titled “Plastic Straps Market by Type (Polypropylene Straps, Polyester Straps, Nylon Straps, Composite Straps, Paper Straps, and Corded and Woven Straps) and by End-Use Industry (Steel, Paper, Fiber, Cotton, Bricks & Tiles, and Others): Global Industry Perspective, Comprehensive Analysis, and Forecast, 2017 – 2024”. 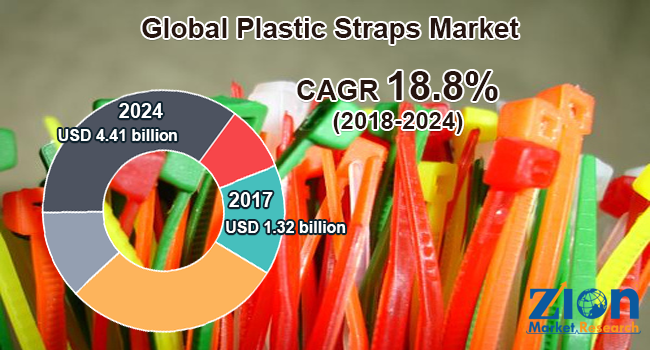 According to the report, the global plastic straps market was valued at USD 1.32 billion in 2017 and is expected to reach USD 4.41 billion by 2024, growing at a CAGR of 18.8% between 2018 and 2024. Plastic straps are made from polypropylene and polyester materials and are available in a wide range of styles, strengths, and finishes. These straps are being progressively utilized in varied industries, such as steel, paper, fiber, cotton, and bricks and tiles. Plastic straps are lightweight, flexible, and can be handled easily, which makes them suitable for bricks and tiles, paper, and cotton industries. The increasing demand from the packaging and logistics sector for plastic straps is likely to drive the plastic straps market expansion globally. Growing product demand witnessed across the construction industry across the globe is further expected to be the key driver for the plastic straps market. Strict government rules pertaining to environment pollution might hamper the plastic straps market over the estimated timeline. These plastic straps are non-biodegradable in nature and have a negative impact on the environment. Inadequate usage and dumping of plastic straps post usage generate plastic waste, which, in turn, causes land pollution. Due to this, countries are promoting the use of eco-friendly products and avoiding the use of plastic straps, which is likely to inhibit the plastic straps market in the ensuing years. Manufacturers are focusing on making innovative products that are likely to create new growth opportunities for plastic straps market in the forthcoming years. By type, this market is classified into polypropylene straps, polyester straps, nylon straps, and others. Polypropylene straps are anticipated to grow at the highest rate in the upcoming years, due to their recyclable nature. Thus, polypropylene plastic straps are preferred more owing to their eco-friendly nature. In 2017, polypropylene straps accounted for the largest share of the overall plastic straps market. By end-use industry, this market includes steel, paper, fiber, cotton, bricks and tiles, and others. The paper segment formed the largest end-use industry of the market in 2017. Plastic straps are utilized for bundling items for convenient handling and shipment of newspapers. Furthermore, increasing demand for plastic straps in the paper industry is likely to propel the plastic straps market growth in the upcoming years. The Asia Pacific was the leading market for plastic straps and held the largest market share in 2017, whereas Europe held the second largest market followed by North America. Furthermore, Asia Pacific is predicted to be the fastest growing plastic straps market in the near future. The Middle Eastern and African and Latin American markets for plastic straps are supported by government rules and environmental-friendly legislations. Brazil and South Africa are likely to be the major contributors in the years to come in these regional market.